I’ve only stayed with a Club Carlson hotel once in the last several years but thanks to owning a Club Carlson credit card, I’m considered an elite member. Today I received an email with information about a promotion for elite members only. Simply book a reservation using the Club Carlson mobile app by April 5th and complete the stay any time in April and they’ll give me 5000 bonus miles within 10 days after I complete the stay. Be sure to note that the fine print states that the room must paid in full – and in advance (!) – to qualify. Points + Cash reservations do not qualify for this promotion. I don’t have any travel scheduled for the month of April and even if I wanted to make a mattress run, there’s no Club Carlson property within about 200 miles of me so I won’t be taking advantage of this promotion. Besides, as easy as Club Carlson points are to accrue, this offer is not enough to make me change a booking. It’s issued by US Bank, so you can have this card in addition to the number of Chase, Citibank and Amex offerings. If you’re planning to apply for several cards on one day, anecdotal evidence suggests it’s good to apply for this one first as US Bank doesn’t like to see a lot of applications within 90 days or so. On award stays of 2 nights or more, the last night is free when you own this card. That means if two people are sharing a room and they each own the card, each person could make a reservation for two nights and the second night would be free! Just alternate the reservations and it’s half the points. Each year you pay the annual fee, collect a 40,000 point bonus just for keeping the card open. 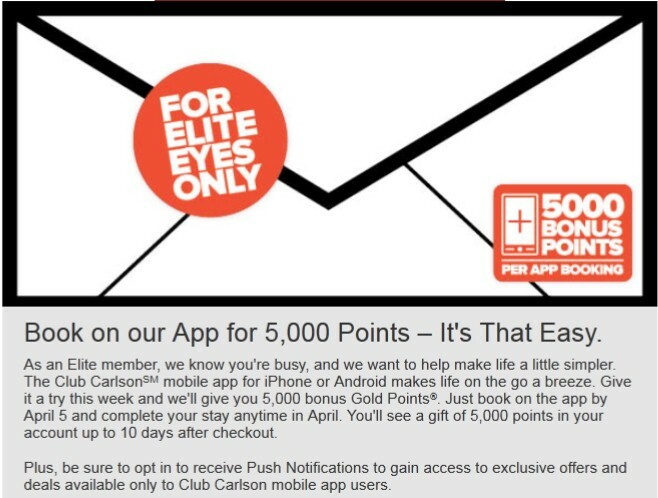 The card earns 10x points at Club Carlson hotels and 5x points everywhere else. So an extra 5000 points is great but I won’t be going out of my way to earn it. Note: I have no affiliation with US Bank or Club Carlson. The link provided will profit a very deserving blogger, though I am not affiliated with his blog either. It appears that the Avios that disappeared from people’s British Airways accounts over the weekend are being restored. I checked my account and they’re all back – all 193 of them. Did your Avios go missing and have they been restored? If you’re looking to earn some bonus Club Carlson Gold Points and have plans for a spring or early summer trip, now’s the time to book. 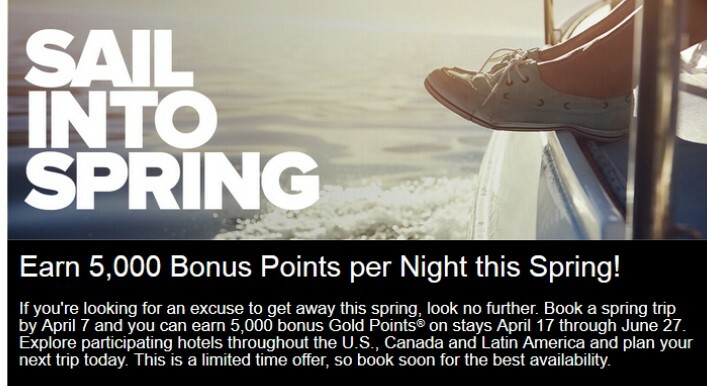 Book your trip by April 7 and you can earn 5000 bonus Gold Points per night on stays between April 17 and June 27 at participating locations in the US, Canada and Latin America. This offer seems to apply only to Country Inns and Suites and to Radissons and not all of the Carlson Rezidor brands. Click HERE for participating Counts Inns and Suites locations and HERE for participating Radisson locations. Today US Airways notified its Dividend Miles members that this weekend Dividend Miles will be transfer to the American Airlines AAdvantage program. All elite-qualifying activity will be combined as well. If you have a US Airways credit card from Barclay’s, that information will be updated with your AAdvantage number too. If you want to book an award with US Airways miles, tomorrow at 11:59 PM CT is the last time to do that. Why would you want to book awards with US Airways miles instead of AAdvantage miles? There are certain “sweet spots” on the US Airways chart which require fewer miles through the US Airways program than through the AAdvantage program. Scott of MileValue.com covers those in his post Top Five US Airways Awards To Book Before It’s Too Late. And on the One Mile at a Time blog, Tiffany covers the reasons why you want to book now with a handy flow chart to indicate which program will work best for your situation. Whatever you decide, Pizza in Motion makes a great point that you should take a screen shot of your mileage balance in each program so that you can be sure your AAdvantage balance is correct once you’ve been notified the merger is complete for your account. After wrapping up our visit with our friend who lived in Pasadena, we opted to stay near the airport for our last night in town. Prior experience had taught us that though it was great to stay out in Pasadena/Arcadia/Monrovia, when it was time to catch our flights if we stayed there then we had to get up earlier. This was our first time to stay near the airport before a flight home and I think it’s a practice we will continue. Arranging our stay like this let us not worry about when our flights left as the hotel has an airport shuttle so my friend could return the car convenient to her flight and I didn’t have to get to the airport two hours earlier than I really needed. We’d stayed in a Hyatt Place once before (though not this one) so I had a good idea of what to expect and this property lived up to my expectations. We were welcomed at the front desk and promptly given keys to our room. 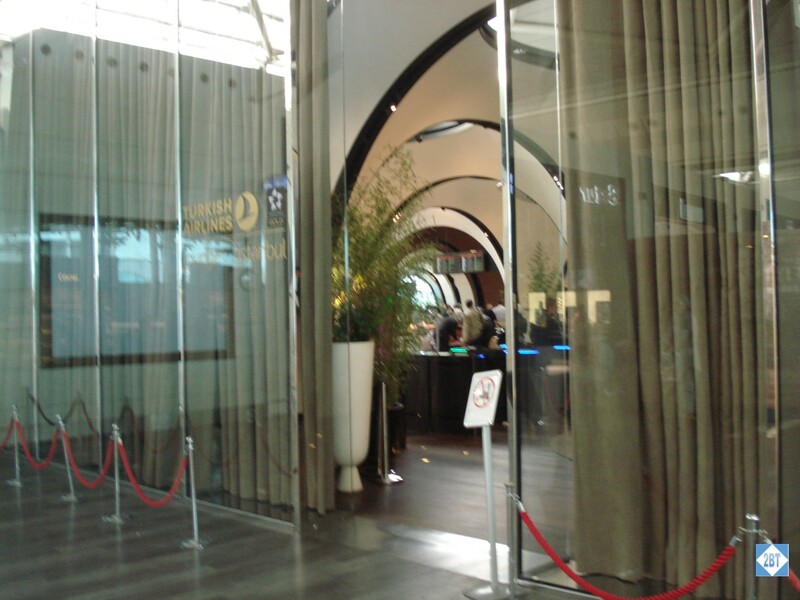 The staff members were friendly and went over the details about the airport shuttle – I did need a reservation even though it was free – and briefed us on breakfast. 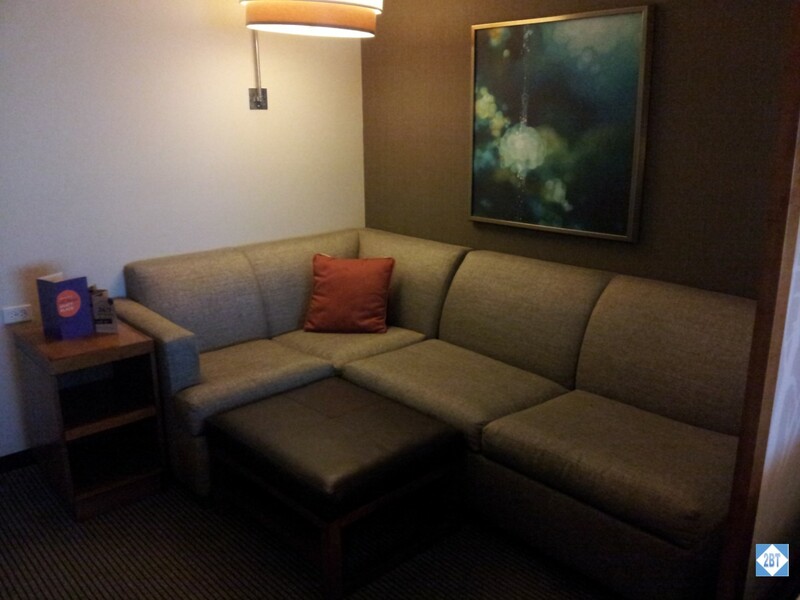 We took the elevator to our room and found just what we expected: a small living area with a sleeper sofa, two queen beds and a bathroom. The beds were comfortable and there were several pillows on each bed. A central nightstand had outlets for our electronics. Frontier Airlines returned to Memphis fairly recently and earlier this month I had the opportunity to fly them on a one-way ticket from Los Angeles to Memphis via Denver as they had by far the best price for my date. As it had been a number of years since I’d flown them I was a little surprised about the pricing for carry-on bags that do not fit under the seat. I’d heard the company had become more like low-cost carriers but I didn’t realize this included the carry-on baggage charges. So when I priced things out, it was cheaper to check my bag than to carry it on. Now Frontier is raising prices for checked bags if you don’t pay for them before you reach the airport for flights beginning on May 1, 2015. If you try to carry your bag on and it won’t fit or there’s no room and it must be gate-checked, the fee increases from $50 to $60. That’s the largest price increase. If you pay for your first checked bag online during the check-in process, the fee increases from $20 to $25. If you pay for that same bag at the airport the price increases from $25 to $30. The fee for a second checked bag at the airport changes from $30 to $35. There is no change in the price for checked bags paid for before check-in. There are a number of different prices charged depending on WHEN you pay for the bags (online before check-in, online at check-in, at the ticket counter/kiosk, at the gate) and HOW you pay (online, in person, via phone). Check the Frontier Airlines website for your exact situation. Last week members of American Airlines’ AAdvantage program and US Airways’ Dividend Miles program received emails regarding the progress of the airlines’ merger in regards to the loyalty programs. For awhile we’d had word that the programs would merge during the second quarter of 2015 and it appears that not only are things on track for that, but that the merger will happen in April. If you have miles in both programs and haven’t already done so, log into either your AAdvantage or Dividend Miles account and take note of the special banner inviting you to manually combine your accounts. It’s very simple and – speaking as an IT person myself – it will help out the IT folks if you take the reins and match up your accounts yourself. For this to work properly, your name must exactly match on both accounts and I suspect your address must match exactly as well. If the account data doesn’t match sufficiently, there will be instructions on how you can get the accounts to match. Once we combine programs, we’ll begin transferring your Dividend Miles mileage balance, Preferred-qualifying activity and million mile balance into your AAdvantage account on a one-to-one ratio. We’ll determine your elite status level by looking at your combined elite-qualifying activity for 2014, and separately, your combined 2015 year-to-date elite-qualifying activity. It may take a few days to transfer everything, but we’ll email you once it’s completed. If you want to book award travel using your Dividend Miles, do so quickly as a few days before the merger, the Dividend Miles award booking function will be disabled. This is your last chance to take advantage of some of the sweet spots of the US Airways award chart, like these top five ways described by Scott of MileValue.com. Change is coming and it’s good to be as prepared as we can be!